This is the second entry about the first verse of De Wâldsang. Part I is available here. The last lesson provided a link of Anneke Douma singing the song. Her pronunciation does vary a bit from the pronunciations I gave in the previous post. If you wish to hear another version of De Wâldsang that follows the first lesson more closely, start the Keallepoaten YouTube video at 3:05. 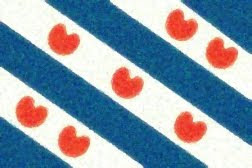 Note that the r is rolled in Frisian. Let's finish up with first verse! I'm planning to post shorter entries on the next two verses, but I am also in the middle of moving. So, this may take some time. Blier means merry and is said with a look “ee” as in “leek” followed by a schwa. BLEE-uhr. Laitsje means “to laugh” and is said with the same vowel combination in “light.” The ending takes a schwa. LIGH-tsuh. Boulân is the word for farmland. It is said with the "ow" sound in the verb "bow" or, better yet, the English word "plough" (which can help with memorization). Lân means “land” and sounds like the English word “lawn.” According to P. Sipma, bou by itself means pasture-land. BAU-lahn. I have to make an educated guess for tierige, as I cannot find a direct translation in any of my Frisian language resources. I believe that it means “healthy.” It is said with a long “ee” sound as in the English word “tear,” followed by schwas in the final syllables. TEEuhr-uh-guh. Greide means grassland. It said with the same vowel in “ride” or “light”: think of riding through the grasslands. The second syllable takes a schwa in the singular and plural forms. GRIGH-duh, GRIGH-duhn. Sjonge means “to sing”. It is said with a -y- gliding into a long “oh” as in “lone.” In sjongende, the final two syllables take a schwa. SYOHN-guh-duh. Fûgel is West Frisian for “bird.” Say the first syllable with the long "oo" sound in "flew" or "food." and with a shwa in the second syllable. FOO-guhl. Sân means "sand" (or "seven" in other contexts). De means "the" and is said with a schwa. Grûn means "ground." It is said with the long "oo" in moon. GROOn. Part I in this series is available here.